Today’s post is written by Sarah Philpott, an online friend of mine who posted here once before. 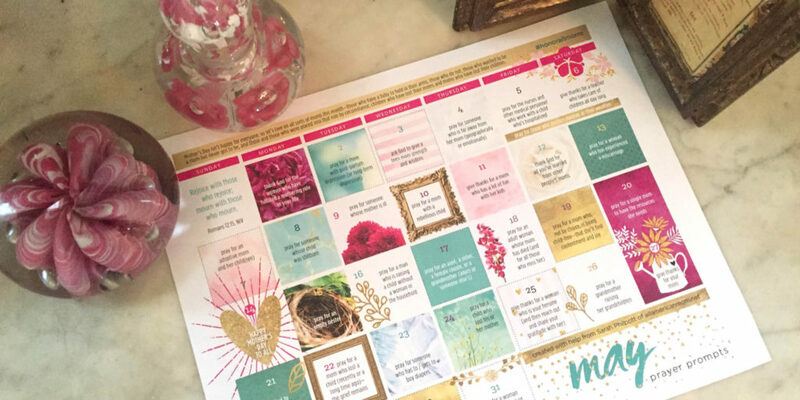 When I held a prayer prompt calendar contest, Sarah approached me about designing a calendar for the month of May to recognize all the women for whom Mother’s Day brings sadness rather than the expected joy. I was completely on board, because after I lost my own mom, I’d had a similar experience. I’d rather cry and go off on my own than “celebrate” on that day—even though I have three kids who I love with all my heart. Sometimes the pain overshadows the joy. And sometimes, people aren’t in a position to feel joy because the reminder of their loss is too great. I’ll stop talking now so you can hear from Sarah, but don’t forget to download the prayer prompt calendar here or on her website. Mother’s Day was celebrated in a big way where I grew up. As a child, I’d sit alongside my family in the slick wooden pew and gaze at the fetching flower arrangements crowding the floor of our sanctuary. Roses, peonies, and spring blooms sat ready to be awarded to the ladies of my small Southern Baptist church. My mother and grandmother would rise and stand amongst the females of my community. It was like a battalion of matriarchs. Then, the ceremony of awards began. We’d quickly find out who was the oldest mom, who was the youngest mom, and who was the mom with the most children. This tradition of honoring mothers is still one of my fondest memories of my childhood. But it wasn’t until I was an adult, sitting in church on Mother’s Day fresh from the heartache of my first miscarriage, that I realized how many women actually had hurting hearts on Mother’s Day. I sat recollecting my childhood and recalled how at my old church the mother with the most living children was awarded one of the biggest and most beautiful bouquets. The congregation always erupted in applause for this dear soul who had her hands full. But now, with a babe in Heaven and one in the church nursery, it struck me as an odd banner of honor. I realized that beneath smiles many women silently mourn on Mother’s Day. I instantly thought of my mother-in-law. She has five children. But only three are living. Jesse died at the age of two and Lauren at the age of twenty. Then I thought of my mother. She has three children. But only two of us are living. A gravestone in the church cemetery only marks one tiny soul, who was stillborn. Then the face of a friend, who wanted nothing more to be a mother, came to mind. Infertility had robbed her of the chance of becoming a mother and finances had prevented her from adopting. She too hurt on this special day. It made me realize that these sweet women—and those just like them who had endured the death of their own children or a dream that never came true, were women who also deserved an extra special bouquet. My grief opened my eyes to the invisible grief that many women bear on Mother’s Day. We often forget these brave women, don’t we? Mother’s Day is still one of my favorite days of the year, and it should be celebrated with unbridled jubilation, breakfast in bed, and homemade cards. And I love how, at Ms. Nita’s gentle encouragement, my childhood church always collectively gave a big applause to mothers. Mothers should receive a standing ovation. But we should expand our celebration of Mother’s Day by showering love and support to all mothers—including those who view Mother’s Day as a stark reminder of what doesn’t exist. Each year, in the United States alone, 1 in 160 deliveries end in stillbirth, 1 in 4 pregnancies end in miscarriage, 3,500 babies under the age of 1 die, and 1 in 8 couples experience infertility. 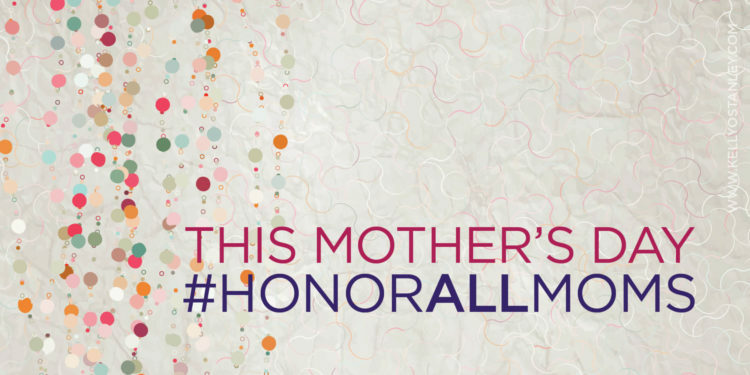 Let’s stand in solidarity as individuals and as the church to #HonorAllMoms this Mother’s Day. Let’s also set aside the month of May to pray and encourage all sorts of women—those who have a baby to hold in their arms, those who do not; those who wanted to be a mom but never got to be, and those who were placed into that role by circumstance; children who have lost their moms and moms who have lost their children. I think Ms. Nita would want all these special women to have a beautiful bloom. SARAH PHILPOTT, PhD lives in Tennessee on a sprawling cattle farm where she raises her two mischievous children (and one little baby!) and is farmwife to her high-school sweetheart. An award-winning writer, Sarah has contributed to academic books, scholarly journals, and outlets such as the Huffington Post. 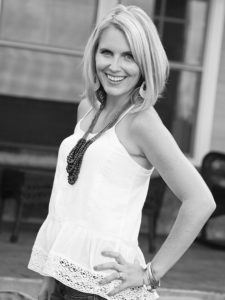 Her book, Loved Baby: 31 Devotions for Helping you Grieve and Cherish Your Child After Pregnancy Loss, will be published in October 2017 by Broadstreet Publishing. Sarah is a lover of coffee (black), rocking chairs, the outdoors, and Hemingway. Visit allamericanmom.net where she writes about life on the farm and cherishing life in joy and sorrow.